← Does Trump understand the Democrats are the America Haters? The “Art of the Deal” relies on reaching a compromise with people over common ground. Where is there any common ground with Democrats? In the following instances where is the common ground? Abortionists vs. Pro-Lifers, where is the common ground between killing babies in the womb and not killing them? Gun control advocates vs. 2nd Amendment rights, where is the common ground between taking away guns and having guns to protect your family? Tax debt vs. Balanced Budget, where is the common ground between debt spending till you’re bankrupt and saving for a rainy day? Open borders vs national sovereignty, where is the common ground between allowing foreigners to invade and take from citizens and maintaining citizen’s rights and laws? Americanism vs. Socialism, where is the common ground between free capitalism and oppressive communism? Nazis vs. Jews, where is the common ground between killing all Jews and living with them? Arabs vs. Israel, where is the common ground between destroying Israel utterly and living alongside them? Islam vs. Christianity, where is the common ground between forcing people to bow to their god and freedom to worship God as they choose? Satan vs. Christ, where is the common ground between hating God and loving God? Liberals believe they are doing what is righteous because they think they are fighting for right, for compassion, for justice. But when their idea of compassion is not to be charitable with their own money, but to steal from others to give to the people they want, that is not charity, it’s theft. 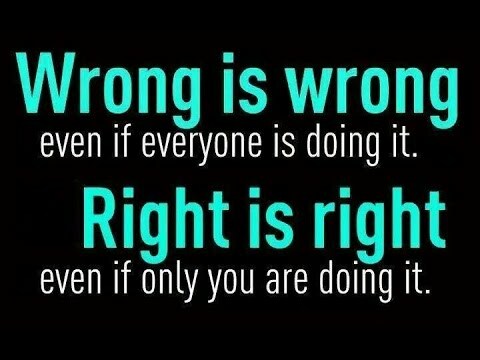 What liberals lack is the moral compass to tell the difference between right and wrong, justice and treachery, godly and animalistic. 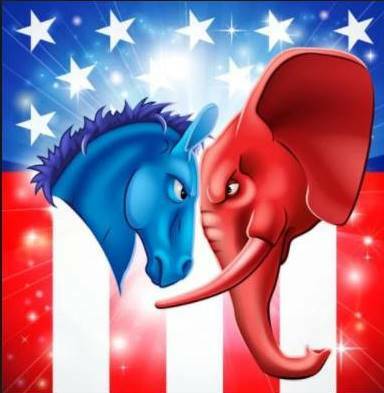 Democrats do not disagree with Republicans – they hate them! Following the shooting of Republicans at a baseball game Democrats took a photo op to pray for them and the next day were fund raising off of the attack promoting more violence while craftily stating they do not condone violence! They are provoking their factions to violence by claiming to be the victims. They condemn murder, but then claim to be killing in self-defense. This is the sickness of Nazi fascism right out of Hitler’s playbook. Leftists who say righteous people are the Nazis also say that the Right shouldn’t call them names because it’s wrong – but it’s only wrong to them. Liars don’t like to be called liars, and murderers don’t like to be called murders, and fascists don’t like to be called fascists. Rush Limbaugh recites Elizabeth Warren: “I have read the Republican health care bill. This is blood money. They’re paying for tax cuts with American lives.” Blood money! So you think some deranged Democrat voter out there hearing that…? [might start trying to shoot Republicans?] How many Democrats does it make now who have said this bill is going to kill millions of people? This is not idle chitchat, folks. When you’ve got a deranged lunatic vote out there already and you tell them and they believe you? You tell them that this piece of legislation is gonna kill people, millions of people? What do you expect them to do? There are those who use violence and deception to force their ideology on others and those who freely express their ideals through argument. If Trump were Hitlerian as Democrats claim then it would not be Democrats who are rioting, it would be Republicans, and it would not be Republicans who are being shot, it would be Democrats. Hitler was the violent totalitarian because violence is how totalitarians seize control. It was when Hitler was not in power that he used violence to coerce the populace into submitting to his will and once he obtained power his violence became more extreme. The same goes for Communists, Fascists, Islamists, Imperialists, and every leftist ideology you can name including American Democrats and their foolish liberal base. Liberals, due to their lack of a moral compass, cannot tell the difference between a righteous society maintaining law and order through law enforcement, and conquerors that will impose their will on others. They think a policeman enforcing the laws to which the people charged him is a tyrant for stopping them from breaking the law! Thieves always resent cops for stopping them from thieving. How do you compromise with a conman? How do you compromise with a thief? How do you compromise with a murderer? Democrats have wanted to establish a king from the day of the Founding. Since they haven’t been able to do so they have sought other means to attain power and impose their will on the people. They do it the same way Mafia gangster bosses do it – through lies, manipulation, theft, bribery, intimidation, terrorism, and murder. Taxes were never meant to be used by government to subsidize their friend’s businesses and laws were never meant to keep the population under control, but to protect the people and keep criminals from running wild! This entry was posted in Fundamentals, Right vs. Left and tagged Americanism vs. Socialism, Art of the Deal, Democrats, Donald Trump, Fake News, Liberal Fascism, Life and Death, Morality, No Common Ground, Republicans, Republicans and Democrats Commonality, Right vs. Left. Bookmark the permalink. When this whole thing finishes playing out, I wouldn’t be a bit surprised to see Nancy Pelosi ousted and Schumer no longer a Senator. Every day, in the news, are remarks by Democrats, some of them ranking, that call on the leadership to concentrate on the economy and not on Russia. If there is collusion, the evidence would already have shown up. While some disgruntled Democrats may relish the idea of forcing Trump to release his tax returns, Rachel Maddow already did (even if she did illegally) and found a big fat NOTHING. My guess is that the Democrats will also find a BIG FAT NOTHING. What good would introducing a bill do? The President would be stupid to sign it, unless he had a specific reason, like trolling, to do so. So the Democrats better be careful what they wish for. Every single person or entity that has taken on the President ended up on the losing end or the laughing stock of the world. Now, if the Democratic leadership concentrated on legislating instead of posturing, weaknesses in Trump’s policies will show up, but at least we would be able to have a political dialogue about it, instead of name calling, vile language, gun shots and random acts of violence against Trump supporters. The Democrats need to own this and people, even Democrats, are getting fed up with this Russia nonsense. Many Democrats do still believe in the Russian meme, but they no longer want their party to waste energy on it. They believe that if evidence exists, it will show up.